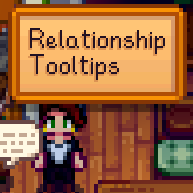 A sleek minimalist tooltip appears above the head of the NPC lucky enough to fall under the grace of your mouse, revealing all you could wish to know of their deepest thoughts and desires. It also helps if you forget who is who. 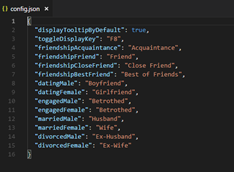 What's more is this may be configured to *your* desire, as all of the text is editable within the Mod's own config.json. This mod shouldn't have any problems in multiplayer as it just runs on your client and doesn't need to sync anything :). 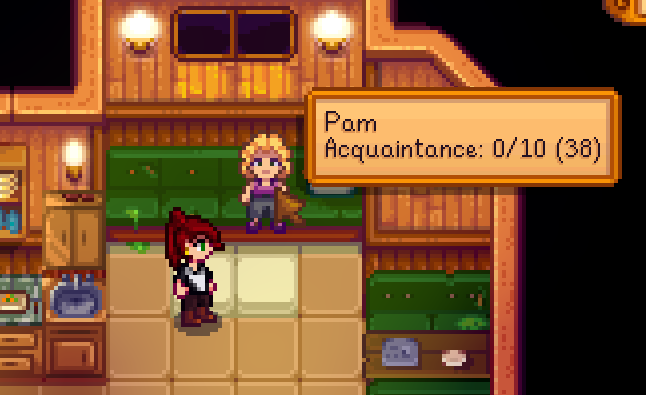 NPC Name - Self explanatory, it's who you're currently hovering over :p.
HeartLevel - Your current heart-meter level with the NPC. MaxHeartLevel - The highest attainable heart-meter-level with this NPC. Number of Friendship Points - Find more about these here. The tooltip is also togglable via a keybind (Default F8), which can be configured in config.json. 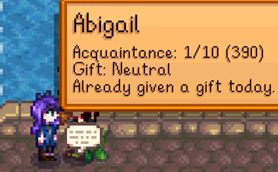 Appears if you're holding an item that can be gifted. You can disable it by setting displayGiftInfo to false in config.json. As of 2.0.0 this includes messages which appear if you've already hit the gifting limits for the day/week. 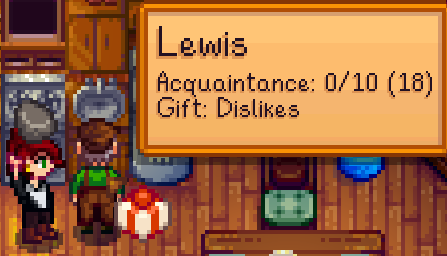 As of 1.2.0, your gifting habits are stored along with your save (separate file to prevent save data corruption) and you'll only know the response to a particular gift if you've gifted the person it before - or have attained a heart level of 7 or higher with them. (The level threshold is custom, and can be eliminated entirely). The accuracy of gift tracking has been significantly improved by 2.0.0. If it isn't present, it'll be generated the next time you play the game. Other players now will have a tooltip which displays if they're the host (Farm owner) or not (Farmhand). 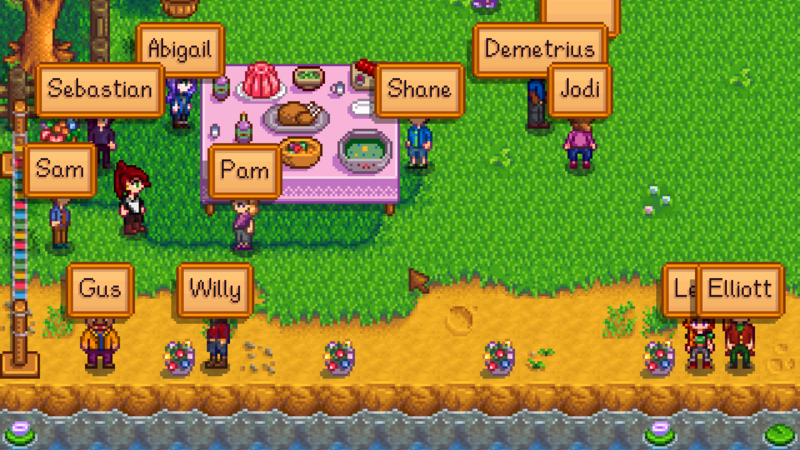 As of 2.0.0 pressing and holding the [Default: Tab] key will show the names of all visible villager NPCs. This can be optionally disabled in config.json. As of 2.0.0 there is now an RT API which will allow players to create simple text addons which display in different situations. The text specified can be displayed on hover of any/all/specific Characters or character types - you can provide conditional limitations which are based on a wide variety of situations. Read more about the API here. You'll need a copy of SMAPI (2.6 or later) to run this, take a look here for help installing it. 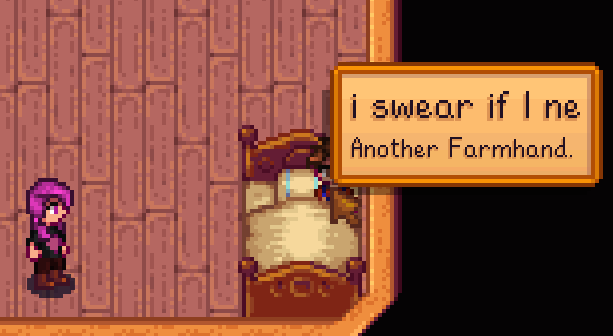 Stardew Valley 1.3 Beta or later. Bookcase 0.5.0 (As of 2.0.0) - For 1.x Bookcase is not required. Thanks to @ashzification from SMD Discord for the idea suggestion. Worth noting that this mod combos quite nicely with Gift Taste Helper.